KATHMANDU, Dec 16: The Nepal Stock Exchange (Nepse) benchmark index fell 10.34 points to close at 1,520.15 points on Thursday -- the last trading day of the week. The stocks have slumped amid counting of votes of the recently held elections of federal parliament and provincial assemblies, which is likely to hand over nearly two-third majority to the 'left alliance'. Analysts say that the fall in stocks is a reflection of weak confidence of investors as the 'left alliance' is poised to form the government. Though the market was on a correction mode for the last few months due to rise in interest rates, the elections were expected to give a boost to shares as used to be the case in previous polls. However, the announcement of forming 'left alliance' by CPN-UML and CPN (Maoist Center) and plan to later unify the two parties has sent jitters among stock investors who seemed to be worried that the communist alliance might not be friendly to the capital market. However, leaders of the left alliance have been trying to assuage fears of the investors, saying that they are committed toward the development of the market. So far, investors appear not to be convinced by the commitments. Some analysts also say that a surge in supply of bonus shares and rights issue has also led to the decline of share prices in recent days. Most of the trading groups registered loss this week. Insurance group fell highest by 160.99 points to close at 7,894.84 points. Sub-indices of Hotels and Development Bank slid 44.48 points and 27.76 points, respectively, closing at 2,146.25 points and 1,748.23 points. Hydropower group ended 25.48 points lower at 2,056.83 points. Banking, the heavyweight trading group, also shed 9.43 points and settled at 1,295.78 points. Microfinance, the newly created sub-index, went down 8.95 points to close at 1,845.48 points. Manufacturing and processing group, however, remained the highest gainer of the week as its sub-index jumped 43.88 points to end at 2,523.01 points. Sub-indices of 'Others' and Finance groups rose 17.35 points and 3.71 points, respectively, settling at 902.91 points and 760.4 points. Trading group, however, remained unchanged at 205.24 points. A total of 5.8 million units of shares of 179 companies worth Rs 2.93 billion were traded in the market this week through 23,727 transactions. The turnover is 61.54 percent higher than the last week. 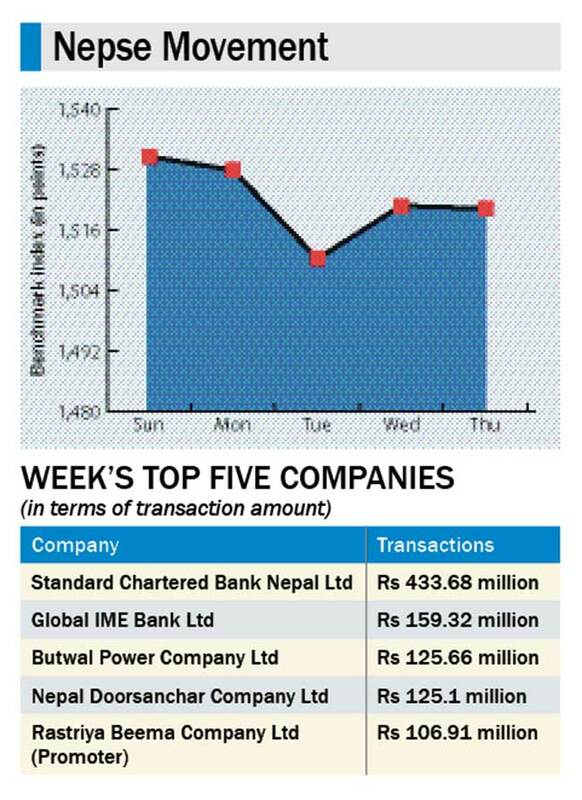 Standard Chartered Bank Nepal Ltd topped the list of companies in terms of turnover (Rs 433.68 million) and number of transactions (3,616). Global IME Bank Ltd became the top company due to number of traded shares (482,000 units). Rights shares of Alpine Development Bank Ltd, Himalayan General Insurance Company Ltd and Muktinath Bikas Bank Ltd and bonus shares of Neco Insurance Company Ltd were listed in the stock market this week for trading.